Airplanes In Action & Military Power In Action! Bring the excitement of aviation home to enjoy on your big screen TV! Click here for the screening room! This 4 DVD set features Volume 1 through 4 from the early days of NASA through the Space Shuttle program. Total running time for this 4 DVD set is 4 Hours. Witness the early years in Astronauts and Friendship 7 as some of America's earliest heroes circle the Earth. 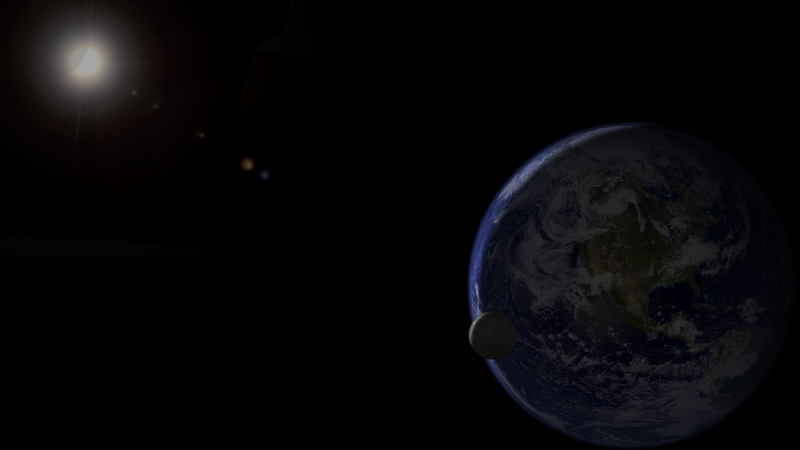 Then explore the moon's surface in Assignment: Shoot the Moon and take a giant leap with Neil Armstrong and Edwin "Buzz" Aldrin in The Eagle Has Landed. Experience success and failure during Apollo 13: Houston, We Have a Problem, and watch the future of space exploration unfold in Who's Out There? and The Mission of Apollo/Soyuz. Finally, before beholding the grandeur of the first space shuttle mission in Space Shuttle: A Remarkable Flying Machine, retrace NASA's progress from its inception in 1958 in Small Steps, Giant Strides: 1973. With spectacular film footage, still photographs, and informative commentary, this Collector's Set is a must for anyone who has wondered what's out there. 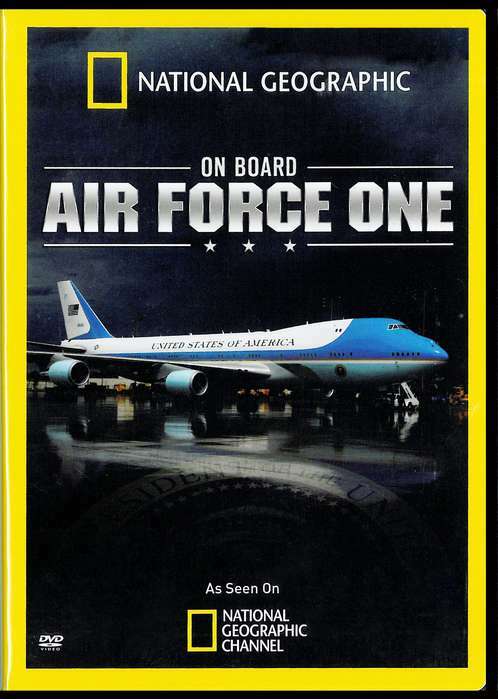 National Geographic takes you on an exclusive tour inside Air Force One, part luxury hotel, part super-secret military command post. From its beginnings with President Roosevelt making a secret wartime flight in 1943 - to the historic flight that returned President Kennedy's body to Washington after his assassination - to the closing months of the Clinton administration, Air Force One takes you through the history of the world's most powerful plane. Features exclusive interviews with Presidents George W. Bush, William Jefferson Clinton, George H. W. Bush, and Jimmy Carter. A Must See For AF1 Fans! - Adults & Kids! 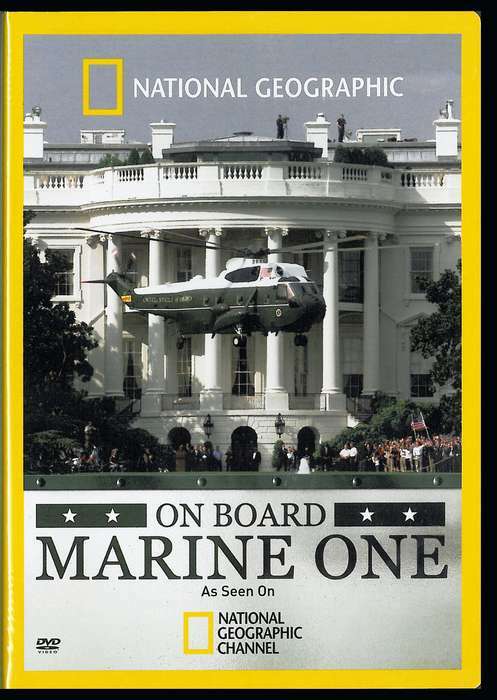 Go inside the tightly guarded gates of HMX-1, the Marine Corps' oldest and largest helicopter squadron, and see what it takes to fly the president where Air Force One can't. Learn about the rigorous training and testing needed to become one of the privileged few working directly with the president's travel team. Then, visit "The Cage" at Quantico Marine Base, where Marine One helicopters are kept. Air Force One: It is America's plane, a national icon and the most secure aircraft in the world. Journey aboard, as the members of the Presidential Airlift Group, fly this specially modified 747 in a time of global uncertainty, following September 11th, 2001. 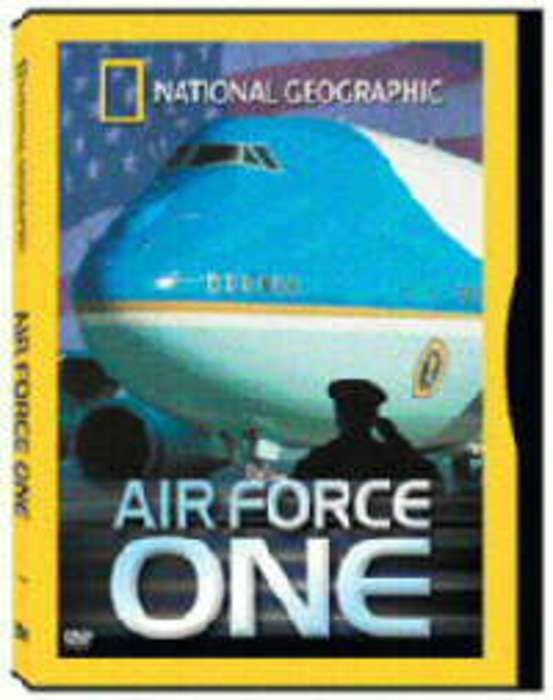 Seven years later, with exclusive access, National Geographic joined the crew of Air Force One to document a diplomatic mission of historic significance and scope: an eight day tour through six countries in the Middle East. This Journey summons recollections of another high-stakes mission to the region, one set in the heart of conflict - the President's secret flight into Baghdad, Thanksgiving Day 2003. Following a steep, corkscrew descent, their landing into Iraq was unannounced and unexpected. Witness how each member of the PAG, from maintenance and engineering to the flight crew and presidential security detachment, were ready for a highly publicized trip, as the President meets foreign leaders on the ground in the heart of the Holy Land. 50 minutes. 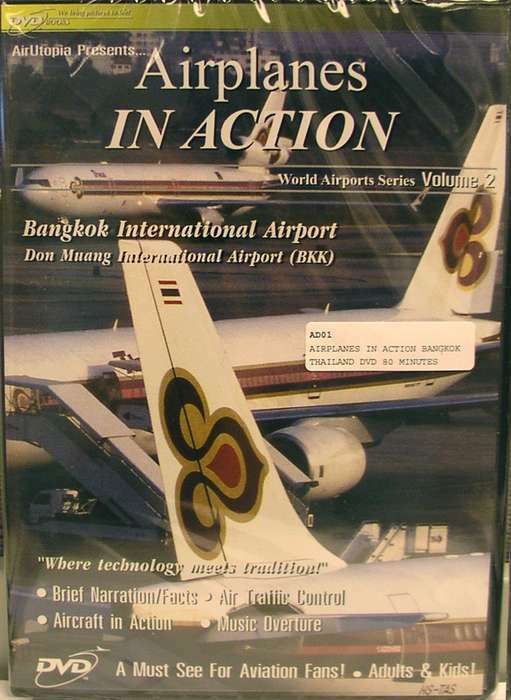 “Where technology meets tradition!” OVERVIEW: Join us at Bangkok’s Don Muang International Airport with over 80 airlines, from North Korea’s AIR KORYO to ROYAL BHUTAN and UNITED… BKK is a 24-hour airport with passenger, cargo, and military flights operations: Did you know a golfer has to cross a taxiway to complete a full round of golf? Our cameras catch the action from many locations and even catch some military such as a C17 and C5 Galaxy! Our Musical Overture “Sheherazade” is a fitting tribute to Bangkok, also known as the Jewel of the Orient. Fasten your seatbelts and fly with us to Bangkok International Airport (BKK)! Includes a beautiful cockpit approach! A Must See For Aviation Fans! - Adults & Kids! 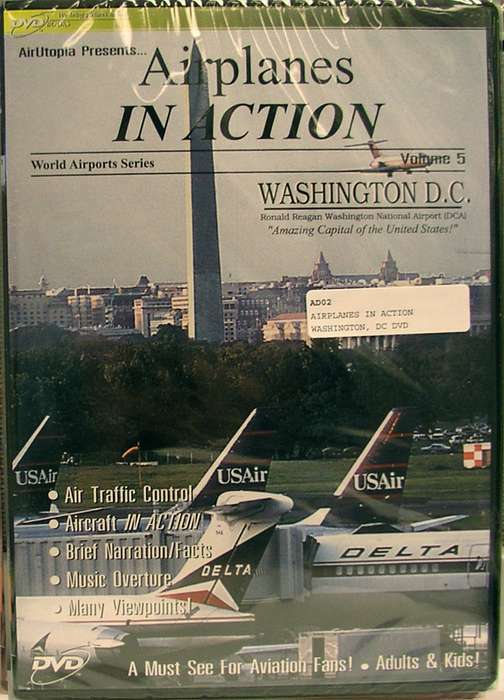 “Amazing Capital of the United States!” One of the most scenic airports in the USA! Join us at busy Washington and see close-ups of all MAJOR US airlines as well as Spirit – National – American Trans Air – Air Canada and more! This is a super exciting airport as very few offer the viewer a close view to the action! 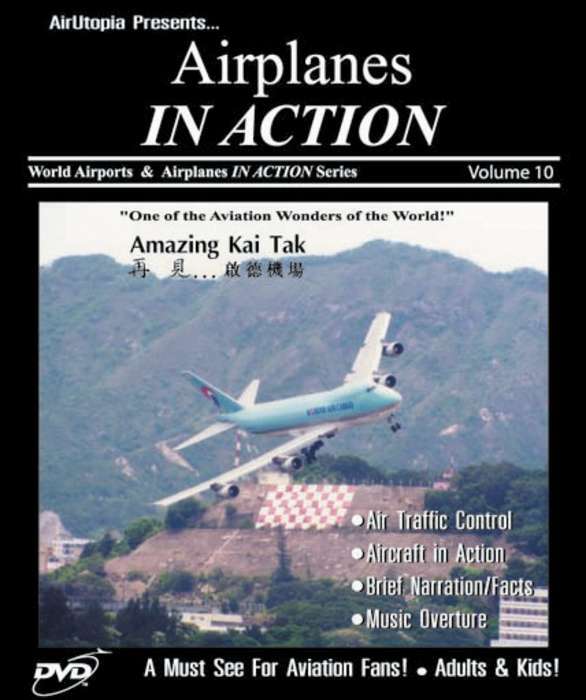 (80mns) INCLUDES: Air Traffic Control – Narration – Airline/Aircraft Facts– Music Overture – Window seat arrival at night – Airlines/Private/Gov. OVERVIEW: Washington Reagan National today is one of the busiest airports! Join our flight team and see the live action of many airlines and corporate aircraft landing and taking off at this exciting airport. Watch planes fly only 50ft above your head on final approach into runway Runway 19! Planes flying so close overhead that one hears the wake vortex in the air! Enjoy this along with the U.S. Capitol and Washington Monument set a scenic background for one of the best strategically placed airports in the world… only 5 minutes from downtown Washington D.C.! All major U.S. carriers serve DCA including Air Canada, Spirit, Frontier, National Airlines, Midwest Express and many more! (Overture Music: “William Tell Overture”) A Must See For Aviation Fans! - Adults & Kids! 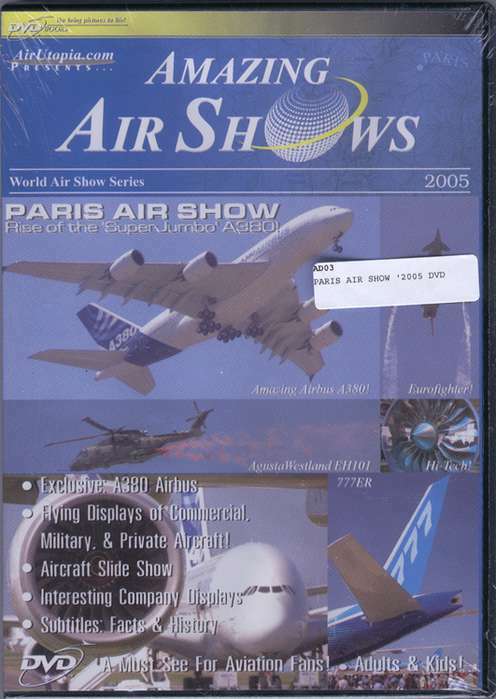 95 Minutes - A spectacular production covering the Paris Air Show with tribute to the debut of the biggest airliner in aviation history - the Airbus A380 Super Jumbo! Go from the interior to the Static Displays of hundreds of aircraft along with Live action flying display. Watch the A380 make it's first public appearance along with other flying displays bu the eurofighter typhoon, F16, F18, Dassault Mirage 2000, the new long range Falcon 7X business jet, Eurocopters and classics aviation aircraft like the Lockheed Constellation and other ultra light aircraft. Tropical Aviation Paradise with Amazing Beach Approach! 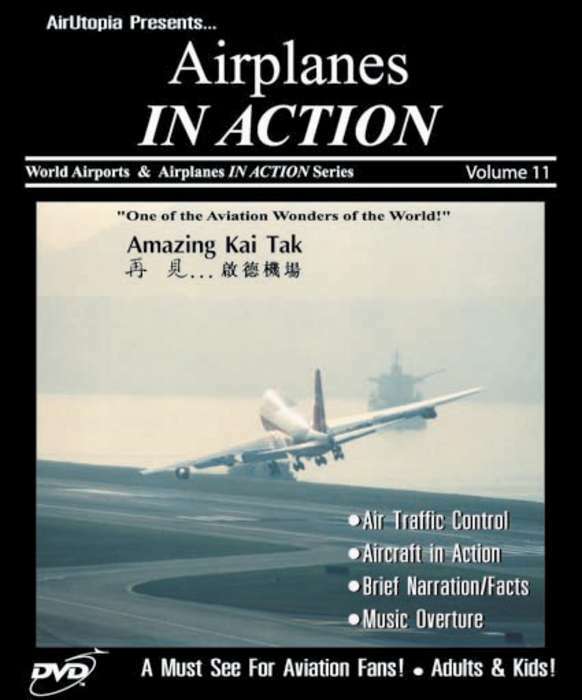 Air Traffic Control - Aircraft In Action - Brief Narration / Facts - Music Overture - Many Viewpoints! Operation Desert Storm... Where few have gone before! F-14 Cockpit - Exclusive: Gulf War Footage - Brief Narration/Facts - Pilot Commentary - Extreme Low Level Flying Video! 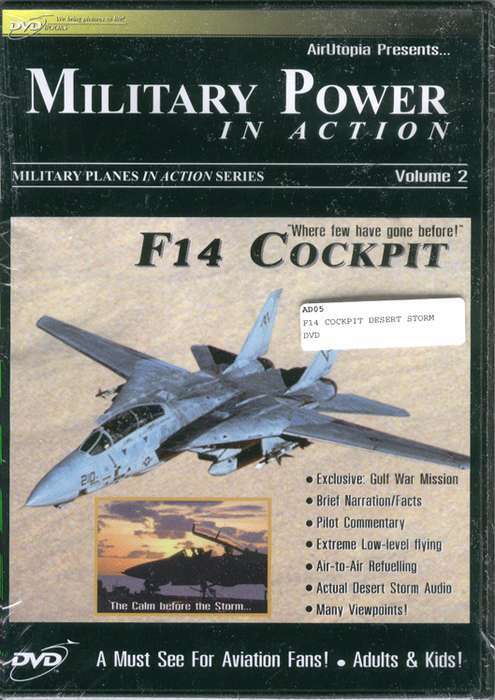 - Air-to-Air Refueling - Actual Desert Storm Audio - Many Viewpoints! Operation Desert Storm... First Air Attacks! 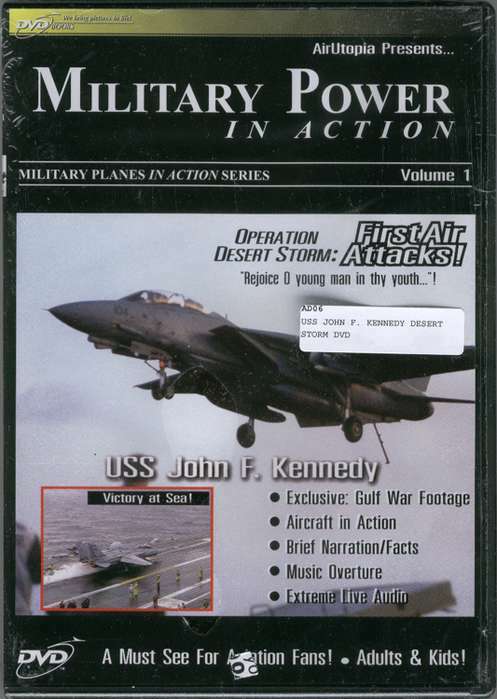 USS John F. Kennedy - Exclusive: Gulf War Footage - Aircraft in Action - Brief Narration/Facts - Music Overture - Extreme Live Video! 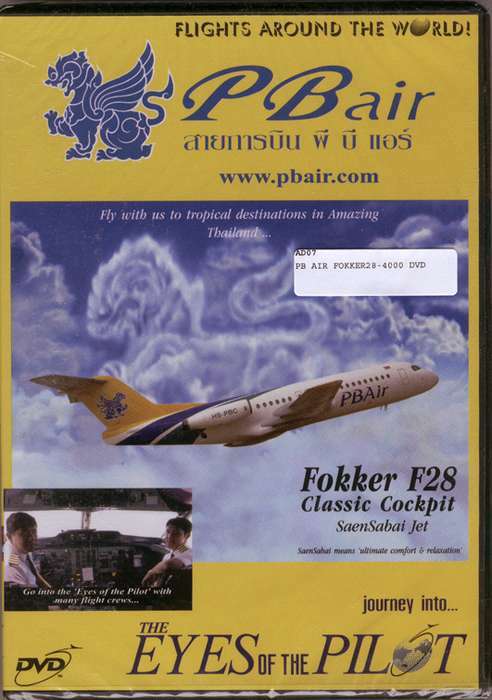 Fly with us to tropical destinations in Amazing Thailand... Fokker F28 Classic Cockpit SaenSabai Jet. SaenSabai means "ultimate comfort & relaxation". Journey into the eyes of a Pilot with several flight crews! 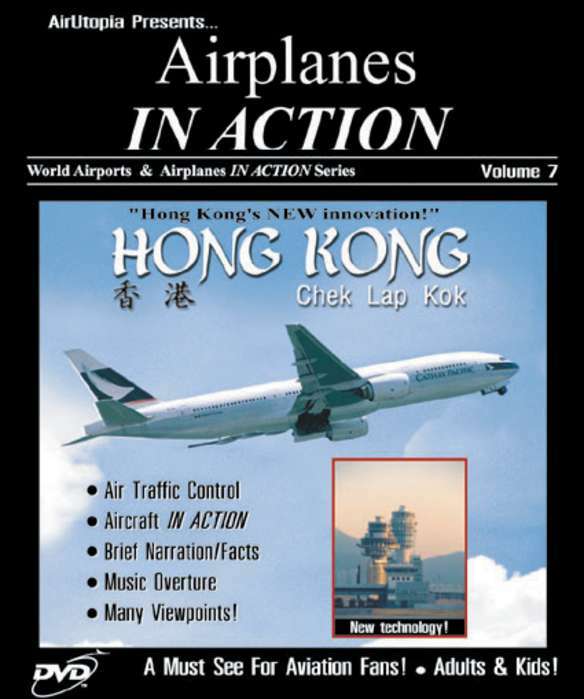 On May 2nd, 1998, a Cthay Pacific Airways 747 Jumbo Jet landed at HKIA-Hong Kong Chek Lap Kok (CLK) International Airport! Hong Kong's New Airport and an innovation in design! See the action from around the airport including from overlooking hills close-up! 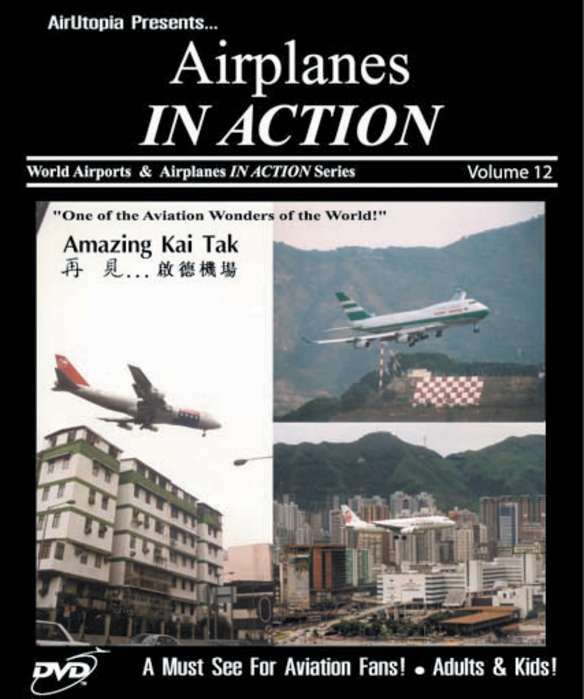 Unlike HK's old airport Kai Tak-CLK is away from the city and is open 24 hours a day, is surrounded by ocean and mountains, and has a modern and futuristic. Join the action at the greatest airport in aviation history. This program films the rare Crash Recovery of a C130 Hercules. Filmed in 1994-95. 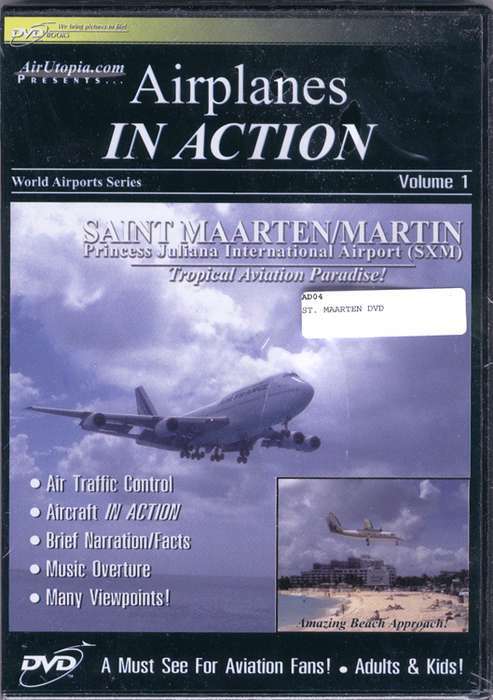 Join in the action at the greatest airport in aviation history. 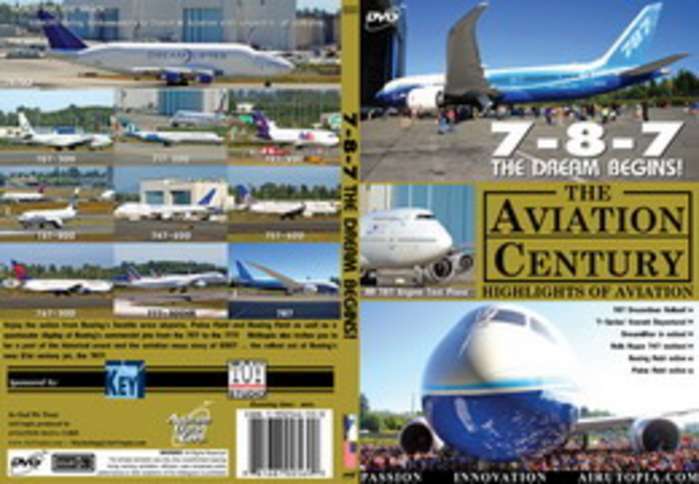 This program films the rare visit by the famous Air France and British Airways Concordes!! Filmed in 1994-95!! Join the action at the greatest airport in history. This program films a rare Emergency Landing by a Jumbo Jet!! Filmed in 1994-95. PayPal shopping cart upon Checkout. Thanks!